Yesterday I Made a post about why 4 oclock was the best blog time. I was watching BBC television today and there was a piece about English Judges. 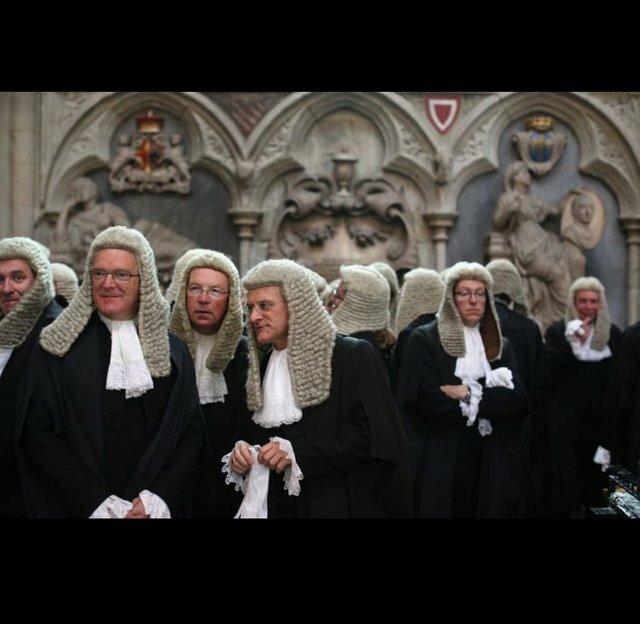 Why do judges in England wear a wig? The wig has traditionally been a means to make the judge neutral, just like the toga they are wearing. The judge is not a judge because of his name, or because he has the right friends, he sits there because of his impartiality and his knowledge of the law. Personal characteristics are eliminated. Think of his clothes, religious symbols and even his hair color. In England, old use is still very traditional. In certain cases judges and lawyers are still wearing a wig with horse hair and a toga. I think its nice that traditional things still are present in the now. It depends on the reactions, theoreticly this should be te best time to post so... but it sounds nice, do a 4o’clocky ! !